Malaysia’s Breastfeeding Consultant and Parenting Coach, Gina Yong (far left) and Amar Asyraf (far right) receiving the token of appreciation from KAO Malaysia along with Fujiwara Masaki (centre), Tan Poh Ling, and Ngo Wei Foo. 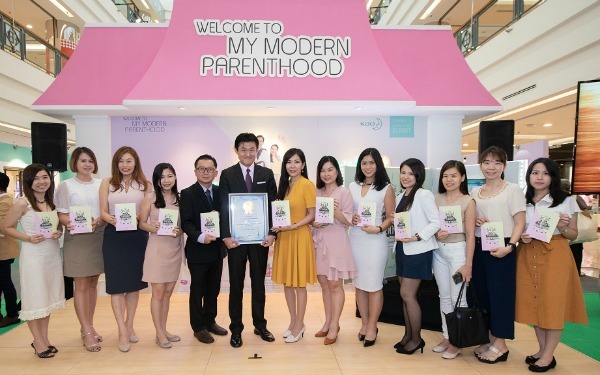 KAO Malaysia was given the title of Most Number of Parenting Guidebook Distribution in a Year in the Malaysia Book of Records. 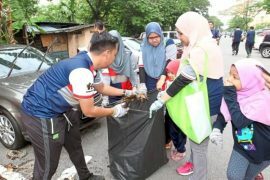 KAO Malaysia doubled its efforts this year by targeting millennial parents aged 25 to 35 years old. “As solution providers, KAO Malaysia is always dedicated in enriching the lives of people. 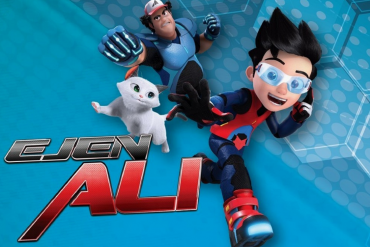 Using our previous campaigns as a reference, we’ve set a new milestone by taking a more digital and innovative approach which suits the current, fast-paced lifestyle of millennial parents,” said Fujiwara Masaki, President of KAO Malaysia. “Technology plays a huge role in their everyday lives and millennials are constantly connected and on-the-go. We’ve decided to take on the challenge by reworking some of our previous initiatives to be made easily accessible at any time within their reach,” he added. Host Nazrudin Rahman with invited influencers during the demonstration of the Magiclean Wiper Mop as President of KAO Malaysia, Fujiwara Masaki and the media looks on. Revolving around this year’s theme, “Value Your Time, Value Your Happiness”, KAO Malaysia has revamped the campaign microsite, including a free-to-download digital version of its renowned parenting guidebook, The Secret to My Modern Parenthood. Co-created with KAO Japan Lifestyle Research Centre and Positive Parenting, the Official Parenting Educational Arm of the Malaysian Paediatric Association, the guidebook provides easy-to-follow suggestions and tricks for manageable baby care and hassle-free housework solutions. As many as 39,000 guidebooks have been distributed to NGOs, hospitals to various childcare partners. 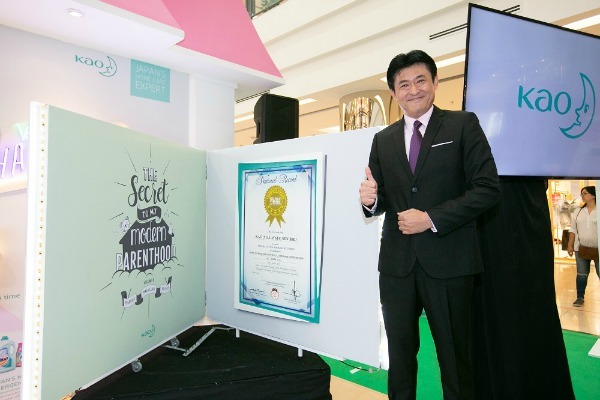 This initiative has led to the induction of the guidebook into The Malaysia Book of Records for “Most Number of Parenting Guidebook Distribution”, as well as its accolade, “Japan Home Care Expert”. A demonstration of the various roles a father can play in creating happy parenthood. Furthermore, selected chapters of the guidebook have been converted into five chapters of video content. Topics highlighted by the videos include the importance of open communication and bonding time, the various roles a father can play in creating happy parenthood, tips & tricks for diaper changing and getting a baby ready for bed, the teamwork of doing laundry together and efficient solutions to housework and baby care. “The launch of this year’s efforts was derived from understanding the wants and needs of millennial parents. This is our fourth year conducting the campaign and our insights have inspired us to better improve our initiatives. 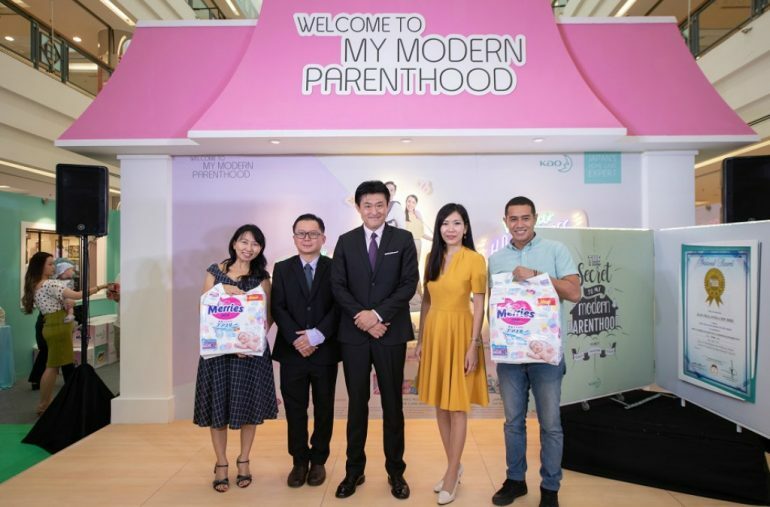 We hope both our products and the “Welcome to My Modern Parenthood” campaign have instilled the brand’s essence in providing timesaving solutions to making parenting and family chores a breeze,” said Tan. KAO Malaysia’s campaign for 2019 ─ ‘Value Your Time, Value Your Happiness’, includes a free-to-download digital version of its renowned parenting guidebook, The Secret to My Modern Parenthood. A baby’s smile signifies that they are happy and comfortable ─ 24 hours a day, 365 days a year. MERRIES diapers with its new three layer air-through system and soft-in air cushion is gentle on the skin, reducing skin irritation. Millennial parents will not have to worry about their babies’ discomfort as MERRIES diapers have an ultra soft and fluffy surface. Unwanted leakages can be avoided as MERRIES diapers come with 3D side gathers and back gathers. MAGICLEAN wiper mop and sheets provide quick and easy cleaning with just one wipe. Less of a workout; more of a solution especially for millennial parents! Not only that, MAGICLEAN also provides total home cleaning solution from the kitchen to bathroom. From walls and floors to seats and sinks and all corners of a dirty bathroom MAGICLEAN scrub-free cleaning solutions makes cleaning up fast and easy. * No.1 by brand in Japan home care market (kitchen cleaner, bath cleaner, toilet cleaner) in terms of Sales Value based on SRI data of INTAGE Inc.(January 2017 to December 2018). 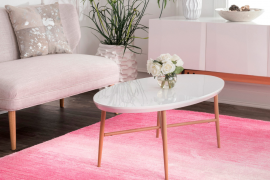 The newly formulated ATTACK Laundry Detergent provides superb cleaning performance with its advanced stain removal and anti-bacterial formula to prevent odour build-up on clothes all day long. It’s an effective laundry solution for millennial parents. ATTACK Liquid Detergent and ATTACK Powder Detergent variants are suitable for overnight and indoor drying. Both types of laundry detergent come with softener clothes for easy ironing. Its refreshing fragrance keeps clothes fresh all day long.